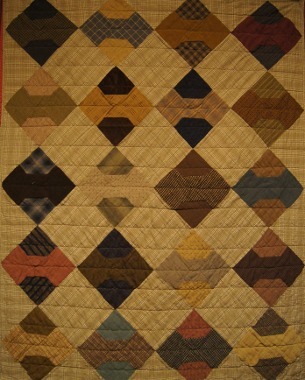 Description: This quilt was inspired by a primitive baby quilt purchased many years ago from an antique store. Just as the original quilt incorporated homespun fabrics and wool, this quilt also features velvet, silk matka, wool and homespun along with brushed cotton and flannel. Enjoy this primitive quilt. A very easy pattern and your own piece of quilt history.